At CTC, we often talk about our mission to help build a gospel movement around the world. In our last Quarterly Snapshot, we looked at what a gospel movement is. Now let’s look at how a gospel movement actually works—what we call a gospel ecosystem. A gospel ecosystem consists of three concentric circles, each representing a key element of a gospel movement. At the core is what we call contextualized, gospel theology. That is, a gospel presentation that makes sense to a particular person. The vertical axis represents gospel theology. At the top of the axis is legalism—the idea that faith plus works make you justified with God. This is wrong, for we are “justified freely by his grace through the redemption that came by Christ Jesus” (Rom 3:21, 24). At the bottom of the axis is relativism—the idea that faith leads to justification before God but no changed life—God accepts everyone no matter how they live. This too is wrong, “For as the body apart from the spirit is dead, so also faith apart from works is dead” (James 2:26). In the middle of the axis is the gospel—faith leads to justification and a changed life of good works. The horizontal axis is contextualization or cultural engagement. On the left is over-accommodation—you so accommodate and adapt to your culture that you don't challenge it. Your only goal is to become attractive and accepted by people in the culture, and you will change anything in your message or ministry to achieve that acceptance. But on the right is cultural withdrawal or cultural warfare—you see the culture as so dangerous that all you do is withdraw from it to remain pure, or you see it as so bad that all you do is confront and denounce it. Neither mode engages the people of the culture. If non-Christians walk into your church service, they will be either unnecessarily offended or hopelessly confused because you have not made an effort to present the gospel in a way that engages the culture. But in the middle of the axis, you are engaged with the culture—you understand the culture and to some degree attract the culture, but you also challenge and convict the culture.The closer your ministry is to the middle—to both a contextualized and a biblically true gospel theology—to that degree, your ministry will be life changing, converting and transforming. The further out toward the ends and extremes, the less life-changing power your ministry will have. CTC helps start churches and train leaders who understand this and are pushing toward the center. 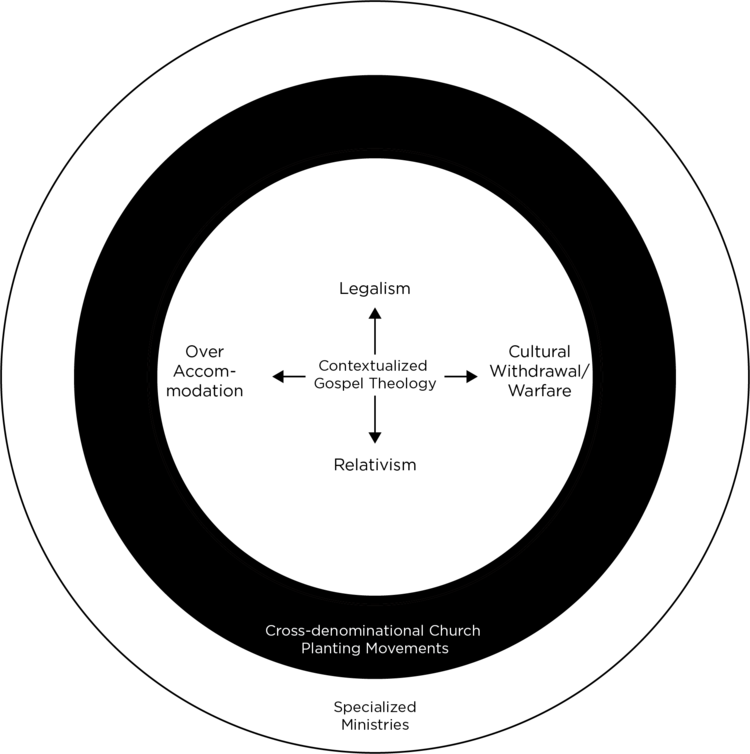 The second circle is a set or series of dynamic, church-planting movements in the city across several denominations and traditions. You may ask why CTC focuses on new churches and doesn’t just work with existing churches. There is no better way to strengthen the whole body of Christ, including those existing churches, than having a set of dynamic, church-planting movements in that city across several denominations. New churches reach unchurched people far better than older churches. It's not just anecdotal evidence or experience. It's been scientifically and empirically proven more unchurched people come to know Christ in a church less than 10 years old. It's even true of Redeemer Presbyterian Church. In the first five to 10 years of that church, more people became Christians per capita then they do now. New churches are more oriented toward outsiders, so new churches reach unchurched people better than older churches. A new church becomes financially self-supporting after a number of years and begins to fund other ministries. Church planting is the ultimate spiritual investment. The funding base of the entire body of Christ grows through church planting. Older churches are more oriented toward the city of 10 to 20 years ago and are a bit out of touch on the newer things happening. Newer churches are oriented more to what is happening right now—including new people and attitudes in the city. Often older congregations are unwilling to try something new, convinced it “will never work.” But when they see it working in a new church, it gives them the courage to try it themselves. This, in turn, strengthens them to reach more people. But what about when I say “across several denominations”? CTC sometimes receives criticism because we are not a franchise that only starts one kind of denominational church. We work with national leaders across denominations to help them reach their cities. We bring the expertise of what we've learned around the world to that particular city, which means we work with churches of many denominations. Non-Christians see different denominations throwing bricks at one another, and it’s a terrible witness. While doctrinal differences are important enough that we do reside in different denominations with distinct beliefs, that is no excuse for ignoring Jesus’ call in John 17 that we are to be one even as the Father, Son and Holy Spirit are one. Truth matters, but we must focus on the areas of greatest importance. Ethnic background, socio-economic class and temperament are all reasons a person might prefer a certain liturgy or denomination. Only together can we really reach a whole city. These differences in preference mean that working across denominations forces us to flex and adapt to each other, and that is great for everybody’s spiritual growth. The outer ring is what we call specialized ministries. Ralph Winter, formerly a professor at Fuller Seminary, wrote a seminal article discussing parishes and orders entitled, “The Two Structures of God's Redemptive Mission.” A parish is a church that ministers to all kinds of people in one place. But an order ministers to a certain kind of people in all places. Those are specialized ministries. You may have a youth group in your church. But Young Life is an order that specializes in reaching kids all over the world. Your church could never have as much experience in reaching youth as Young Life will have over the years. On the other hand, Young Life is not a church. If a young woman in her teens becomes a Christian through Young Life, she has to be in a local church with other people besides kids, or she isn't going to survive. And that’s just one example of a specialized ministry. You need ministries for prayer, evangelism, justice and mercy, faith and work and family life. And you need training ministries where great numbers of urban leaders and church leaders are trained. These institutions must have a symbiotic relationship with each other and with church congregations. Congregations can’t consider themselves most important, and specialized ministries can't think that they do things better than the church. They need to love each other and work together, and together the whole body of Christ grows in quality and quantity in the entire city. When all three elements are present -- contextualized gospel theology, cross-denominational church planting and specialized ministries -- we see gospel movement. For more on Gospel Movements, see Center Church: Doing Gospel-Centered Ministry in Your City by Timothy Keller (Zondervan 2012).